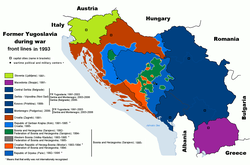 Yugoslavia (/ˌjuːɡoʊˈslɑːviə/; Serbo-Croatian: Jugoslavija/Југославија [juɡǒslaːʋija]; Slovene: Jugoslavija [juɡɔˈslàːʋija]; Macedonian: Југослави��а [juɡɔˈsɫavija]; Pannonian Rusyn: Югославия, transcr. 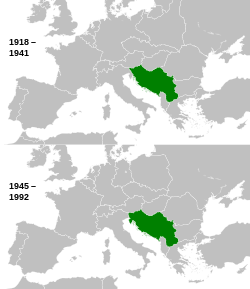 Juhoslavija;[A] literally "Land of Southern Slavs") was a country in Southeastern and Central Europe for most of the 20th century. 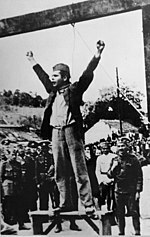 It came into existence after World War I in 1918[B] under the name of the Kingdom of Serbs, Croats and Slovenes by the merger of the provisional State of Slovenes, Croats and Serbs (it was formed from territories of the former Austro-Hungarian Empire) with the Kingdom of Serbia, and constituted the first union of the South Slavic people as a sovereign state, following centuries in which the region had been part of the Ottoman Empire and Austria-Hungary. Peter I of Serbia was its first sovereign. The kingdom gained international recognition on 13 July 1922 at the Conference of Ambassadors in Paris. 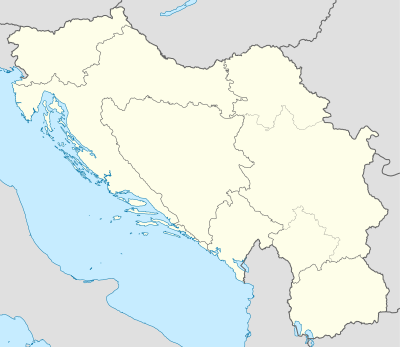 The official name of the state was changed to Kingdom of Yugoslavia on 3 October 1929.